Dobro is a trade name (now owned by Gibson Guitar Corporation) and used for a particular design of resonator guitar. The name has a long and involved history, interwoven with that of the resonator guitar. Originally coined by the Dopyera brothers when they formed the Dobro Manufacturing Company, in time it came, in common language, to mean any resonator guitar, or specifically one with a single inverted resonator. 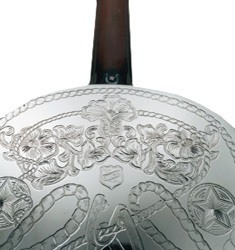 This particular design was introduced by the Dopyeras' new company, in competition to the already patented tricone and biscuit designs owned and produced by the National String Instrument Corporation. 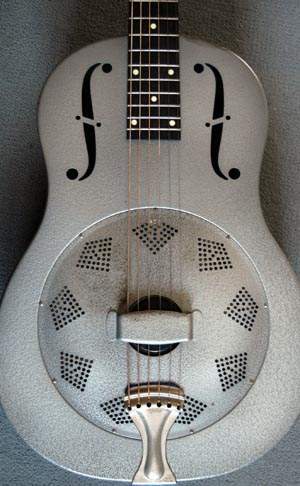 First manufactured in 1927, the Tri-cone is the earliest of various designs for a resonator guitar created by performer George Beachamp and inventor John Dopyera (1893-1988). As the name implies, the Tri-cone employs three shallow aluminum cones (covered by grill work in the lower half of the body) to reinforce and amplify the sound of the vibrating strings, which are acoustically coupled to the cones by a T-shaped bridge. 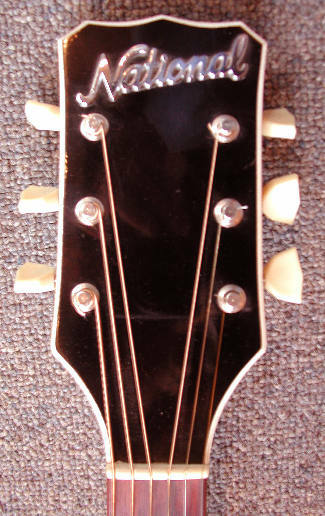 The Tri-cone also has a hollow neck for added resonance, a feature Dopyera may have adopted from the Hawaiian-style guitars made by neighboring craftsman Herman Weissenborn. At least as radical as the Tri-cone's acoustical structures are its body and neck of nickel alloy covered with shiny nickel-silver plating. The gleaming metallic finish and geometric latticework are distinctly in the Art Deco style, but this "Machine Age" look is oddly juxtaposed with delicate engraved flowers on the front, back, and sides that are much more Victorian in flavour. The Dobro brand later also appeared, quite legitimately, on other instruments, notably electric lap-steel guitars and solid-body electric guitars and on other resonator instruments such as Safari resonator mandolins. When Gibson acquired the name in 1993, the company announced that it would defend its right to the Dobro's exclusive use. 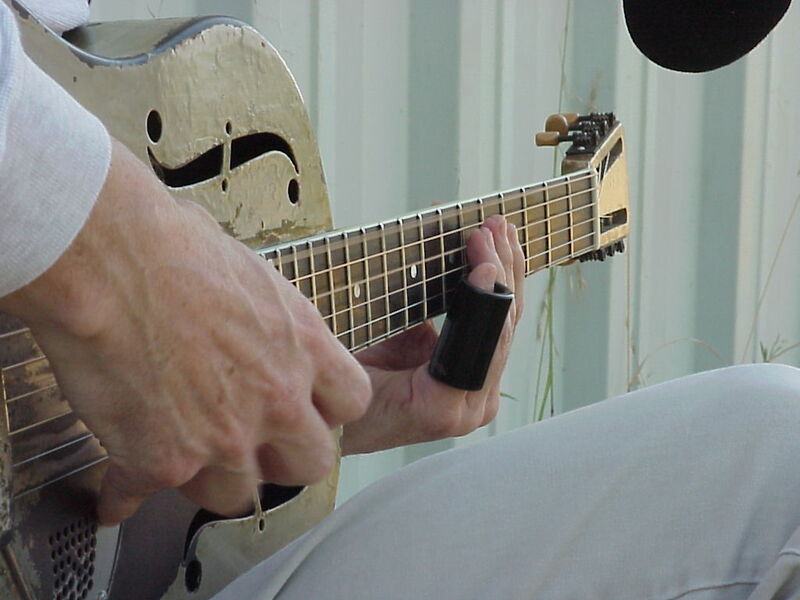 Slim Pickens plays a reproduction of one of these authentic guitar designs, beautifully hand-crafted by Australian luthier Greg Beeton who is based in Newcastle.